LynchyRightNow: Keep It Real . . .Monday? Yes, Keep It Real Monday. Due to technical issues and the recording of The Right Now Podcast Episode 1, Keep It Real is coming to you Monday morning. We're fully loaded, let's get after it. Leading off, Jay Cutler to Chicago. in the last week the Chicago Bears have added over the hill future hall of famer, Orlando Pace, and of course Pro Bowl quarterback, Jay Cutler. The former Broncos signal caller cost the Bears their 18th selection, among other top draft picks this season and next, and of course, quarterback Kyle Orton. New head coach, Josh McDaniels got what he wanted, and much more. With two picks in the top twenty, McDaniels and the Broncos are in the mix for USC quarterback, Mark Sanchez. The risk-taking quarterback type wasn't for Josh McDaniels, and now that quarterback is in Chicago, exactly where they wanted him, far away. Lastly, McDaniels managed to pull off a Belichickian move, trading something he didn't want in the first place for way more than he should have got. The 32-year old head coach watches the quarterback he coveted, Matt Cassel, get dealt between his former bosses. Rather than going back, hat in hand, to Jay Cutler, he deals the him in exchange for a king's ransom. Josh McDaniels is no Romeo Crennel or Eric Mangini, he's a smarter and younger version of them. He's more like Bill Belichick than we thought. AFC West, beware. Keep It Real. Tom Izzo, the best coach in college basketball, KEEP IT REAL. Since 1999, Tom Izzo and the Michigan State Spartans have gone to the Final Four five times. Izzo rarely puts a squad on the hardwood that has multiple NBA players on it, he doesn't recruit just five star recruits, and his teams can play you at your way and his way. After knocking off Louisville in the Elite Eight, Izzo and the Spartans returned to Michigan to upset Connecticut and punch their ticket to the National Championship game. Does anyone need further validation that Tom Izzo can out coach just about any of the major coaches we normally put in the "Top Coach" conversation. From Rick Pitino to Jim Calhoun and anyone else we can come up with, Izzo can out coach them. Connecticut had more talent on that court Saturday night, it's a fact. Jim Calhoun is coaching more than four players who will most likely make some kind of impact in the NBA in the future. You can't say that same thing about Michigan State, but you can see how well coached they are. Michigan State will not get toyed with like both Oklahoma and Villanova just did, a Tom Izzo coached team comes to play and on the games biggest stage, you can bank on that. 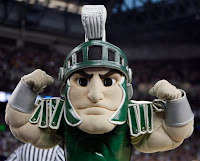 Michigan State can win the National Championship, KEEP IT REAL! Since I last ripped Arizona for offering their top dog position to Tim Floyd, they've made things right. After Floyd spurned Arizona and opted to stay in Southern California, they've sinced talked to LynchyRightNow.com's top choice: Xavier head coach, Sean Miller. If this program wants to get back to where they were during the days of Lute Olson, a constant Pac-10 threat and a team who makes deep runs into the tournament, they need to make an impact with this coach. As good as an opportunity as Arizona is, Sean Miller has a good thing going in Xavier and they'll have to throw top dollar at him to get him to leave. He's got a team that go far into the tournament next year, dominate the Atlantic-10 and with Jaime Dixon having as much success in Pittsburgh, Miller's dream job at Pittsburgh, his alma matta, could open up. If all things go well in the coming days, Sean Miller could make the jump to the West Coast and Arizona would be sitting with one of the top young coaches in the game who wants to be in 'Zona. KEEP IT REAL, this is your guy 'Zona fans. Really Sports Illustrated? Your going to pick the New York Mets to win the World Series? Let's be honest, this team needs to win the National League East and make the playoffs before we pick them to win the fall classic. For a team that needed major help in their bullpen after their last two seasons ending in September collapses, their banking on both J.J. Putz and Francisco Rodriguez to avoid injury, otherwise all bets are off right? Their moving into a new stadium, with new quirks, and they are probably going to have to get used to their new digs before we go ahead and anoint them as National League champs. The Cubs, Dodgers, Marlins, and Phillies have all made improvements in the off season, equal if not better than the Mets have. It's time that SI stop picking the Cubs to break their losing streak, and it certainly isn't time to start picking the New York Mets. Get into the postseason before your picked to win the Fall Classic. KEEP IT REAL!
. . . Stay tuned for more columns and the newly founded Right Now Podcast. KEEP IT REAL!